Even as India grapples with the ravaging effects of the dust storms, which affected 16 states since February this year, the recent floods in parts of Mizoram and Manipur are another sign of what is becoming the ‘new normal’; for instance floods in the time of drought. In fact, a state-wise analysis by scientists shows that in the future, the magnitude of floods is likely to increase by about 25 per cent in Tripura, Mizoram, Manipur, parts of Meghalaya and Nagaland. In Mizoram, which has seen continuous heavy rainfall since Sunday, the water level of the Khawthlangtuipui river continued to rise submerging over 100 houses in Tiperabagh and 70 houses in Serhuan village. Around 30 houses were also submerged in Tlabung town, officials told the media. The most affected districts-Lunglei and Aizawl-constitute 38 per cent of the total area of the state. 10 people were killed and four injured on June 4 when a landslide washed away a building in Lunglawn locality of Lunglei. Mudslides in these two districts blocked major roads making access to the areas difficult. The state disaster management authority is working to restore normalcy but continuous rainfall is hampering the relief and rescue efforts. The irrigation and flood control department of the state warned yesterday of further flooding in the coming days. The IMD further predicts that heavy rainfall in isolated places is going to continue in both the states till June 16. 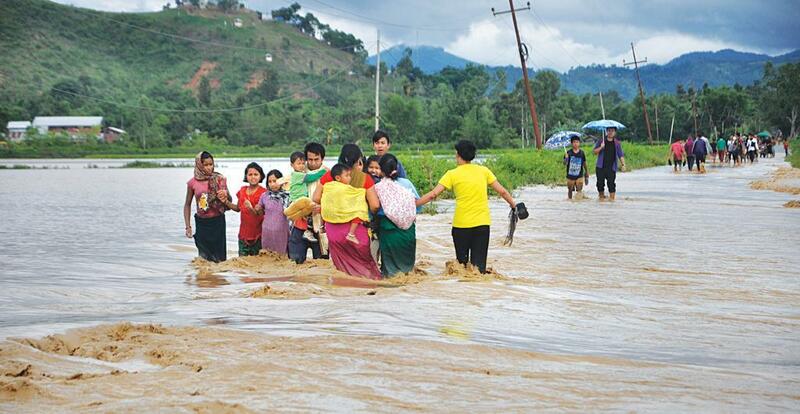 In Manipur, the most affected districts-Imphal, Ukhrul and Thoubal-cover 25 per cent of the total area of the state. The National Highway 37 got blocked due to landslides in Sinam village, some 35 km from Imphal. Rivers Ukhongsang and the Heirok-Wangjing are flowing very close to the warning levels. A torrent of record breaking rainfall in a short span of time, followed by a deficit is becoming normal. For instance, on June 12, Mizoram received 107.7 mm of rainfall, which is 643 per cent more than the normal rainfall. Manipur, on the other hand, received 32.9 mm rainfall, which is 68 per cent more than the normal. This is when monsoon has not even been officially declared in the region. Between June 1 and June 12, Mizoram received 59 per cent more than normal rain but Manipur, surprisingly, received a deficit of 69 per cent. In 2015, a similar trend of less rainfall causing floods was witnessed, which was the worst in 200 years. 60,000 hectares of land in the state was inundated and 500,000 people displaced. At that time, the construction of major dams in the region, such as the Mapithel dam in Thoubal district, was seen as the primary reason for inundation of low-lying areas of Bishnupur, Thoubal and Imphal districts, of which the latter two are affected in the current floods. “The high relative variability and inter-annual variability of rainfall have created increased occurrence of droughts and floods in the recent times, leading to uncertainty in yield and increased agricultural vulnerability,” said a research paper on the climate change vulnerability of North East India published in Current Science in August 2011.